A typical website has three kinds of functionality: code implementing business logic, code implementing user interaction and code rendering HTML pages (presentation). Before PHP frameworks, programmers usually merged these three types of code in a single big PHP script file, which made it a pain to test and maintain such code, especially when you write a large website. Since that time, PHP became object-oriented, and now you can organize your code into classes. The Model-View-Controller (MVC) pattern is just a set of advices telling you how to organize your classes in a better manner, to make them easy to maintain. In MVC, classes implementing your business logic are called models, code snippets rendering HTML pages are called views, and the classes responsible for interacting with user are called controllers. Views are implemented as code snippets, not as classes. This is because views are typically very simple and contain only the mixture of HTML and inline PHP code. The main objective of the MVC concept is to separate the business logic (models) from its visualization (views). This is also called the separation of concerns, when each layer does its specific tasks only. By separating your models from views, you reduce the number of dependencies between them. Therefore, changes made to one of the layers have the lowest possible impact on other layers. This separation also improves the code reusability. For example, you can create multiple visual representations for the same models (changeable themes). First, a website visitor enters a URL in his/her web browser, for example http://localhost, and the web browser sends the request to the web server over the Internet. Web server's PHP engine runs the index.php entry script. The only thing the entry script does is creating the Zend\Mvc\Application class instance. The application uses its router component for parsing the URL and determining to which controller to pass the request. If the route match is found, the controller is instantiated and its appropriate action method is called. In the controller's action method, parameters are retrieved from GET and POST variables. To process the incoming data, the controller instantiates appropriate model classes and calls their methods. Model classes use business logic algorithms to process the input data and return the output data. The business logic algorithms are application-specific, and typically include retrieving data from database, managing files, interacting with external systems and so on. The result of calling the models are passed to the corresponding view script for the rendering of the HTML page. 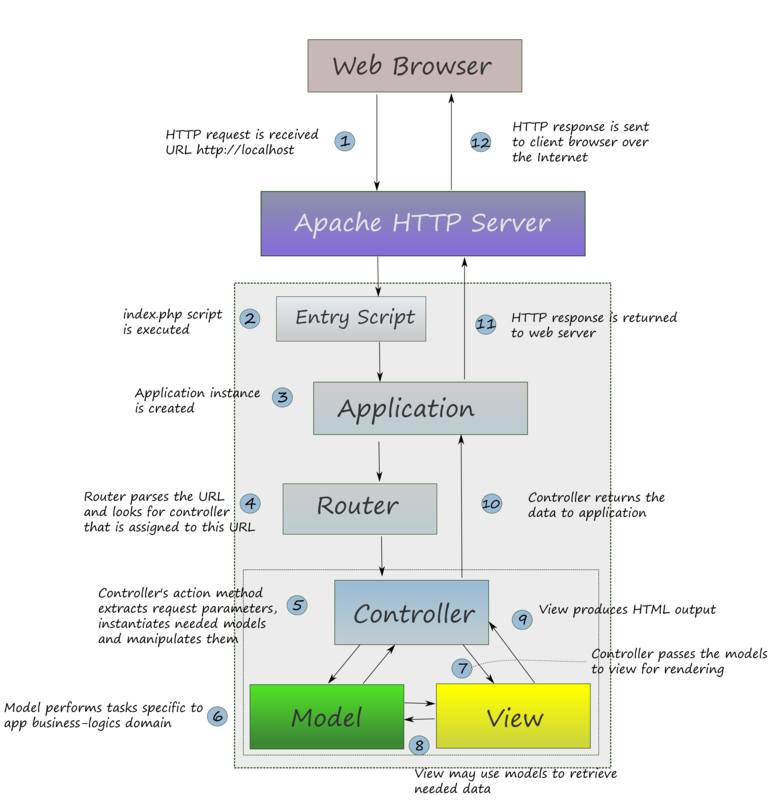 View script uses the model-provided data for rendering the HTML page. Controller passes the resulting HTTP response to application. Web server returns the resulting HTML web page to the user's web browser. The user sees the page in browser window. Now you might have some idea how models, views and controllers cooperate to generate HTML output. In the next sections, we describe them in more details.